View our Send a Kid to Camp Video on YouTube. *Note: before choosing a campaign below, please read the following instructions. There are two ways to make an online donation: if you have created your new online account within the past month, please sign in using the button at the top of the donation screen before making your donation. If you do not have an account, one will be created for you during the donation process. Please allow a few seconds for the page to load, as it must check your browser compatibility. Send a Kid to Camp Campaign 2019 –> Click here to make a donation. Gifts in Honor or Memoriam–> Click here to make a donation. Make a donation to the Darien YMCA in honor of a loved one or friend. Your gift may be made in memory of someone special or in honor of a holiday, anniversary, celebration, or birthday. A note of recognition will be sent to the honoree on your behalf. Your gift to your local United Way through a workplace campaign can benefit the Darien YMCA if you specifically designate it to our organization. Many people choose to make a donation this way, as it helps both the United Way campaign and the YMCA. Contributing to the Darien YMCA through gifts of securities, a will, estate or trust plans can help the Y build long-term financial stability. You can leave a legacy of strengthening the Y’s financial future and thus ensure an enriched community for the next generation. Please contact the Darien YMCA Development Office for more information on making a planned gift. A unique way to give back to the Darien YMCA. Please contact the Darien YMCA Development Office for detailed information on transferring stock. We rely on the generosity of our members and the community to help people of all ages and from all walks of life be more healthy, confident, connected and secure. When you give to the Y, your gift will have a meaningful, enduring impact right here in your own community. For more information on giving opportunities, contact Jennifer Gardner at 203-655-8228 x1302 or jgardner@darien-ymca.org. 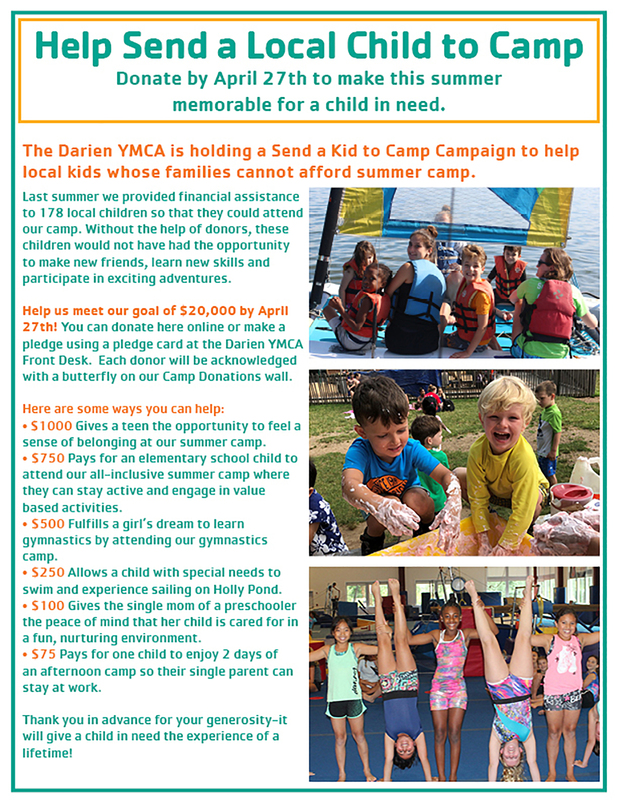 When you make a charitable gift to the Darien YMCA, you help to change lives right here in our community. Whether through the Y’s Financial Assistance program, our extensive programs for people with special needs or the many ways we offer community service – we count on the generous support of our community to make it happen. It surprises many people to learn that there are individuals and families living in our community who need assistance in order to benefit from Darien YMCA programs and services. Some of them could be your neighbors. We deliver programs and services for over 10,000 people every year. We provide over $1.4 millon in financial assistance, community services, and special needs programming every year. We enroll 2,000 children in early childhood education programs and summer camp each year. We have over 4,000 children in youth sports programs. Holly Pond Nursery School graduates make up 20% of kindergarten enrollment in the Darien Public Schools. Over 300 volunteers provide service through the YMCA. We are the only provider of after-school care in Darien. We have over 600 participants attend our special needs sports and programs annually. We provide the athletic training and competitive facilities for Darien High School varsity swimming and gymnastics. We remain the only indoor pool in Darien – used by the whole community. More than 80 lifeguards are certified here annually to keep beaches and pools safe. Our revive cancer rehabilitation program is designed to provide cancer patients with renewed stamina for day-to-day living.